Copyright © 2003-2014 W3C® (MIT, ERCIM, Keio, Beihang), All Rights Reserved. W3C liability, trademark and document use rules apply. <http://example.org/bob> <is published by> <http://example.org>. 01    <http://example.org/bob#me> <http://www.w3.org/1999/02/22-rdf-syntax-ns#type> <http://xmlns.com/foaf/0.1/Person> . 02    <http://example.org/bob#me> <http://xmlns.com/foaf/0.1/knows> <http://example.org/alice#me> . 03    <http://example.org/bob#me> <http://schema.org/birthDate> "1990-07-04"^^<http://www.w3.org/2001/XMLSchema#date> . 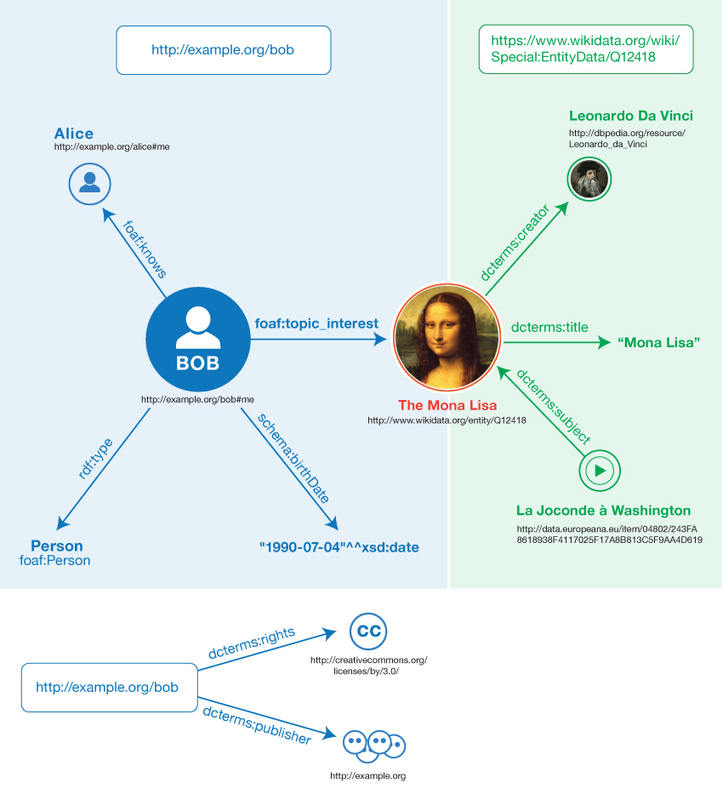 04    <http://example.org/bob#me> <http://xmlns.com/foaf/0.1/topic_interest> <http://www.wikidata.org/entity/Q12418> . 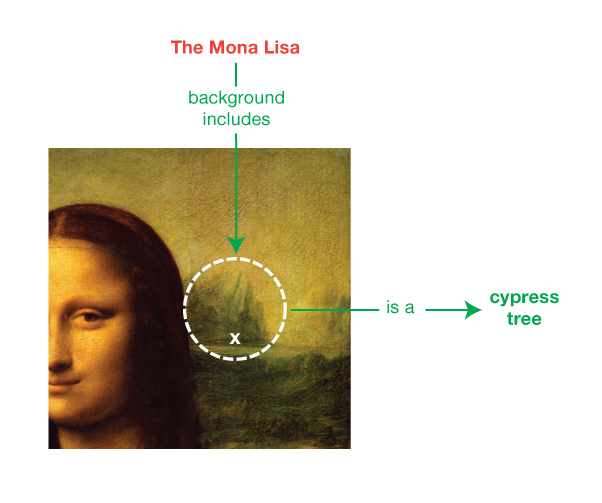 05    <http://www.wikidata.org/entity/Q12418> <http://purl.org/dc/terms/title> "Mona Lisa" . 06    <http://www.wikidata.org/entity/Q12418> <http://purl.org/dc/terms/creator> <http://dbpedia.org/resource/Leonardo_da_Vinci> . 07    <http://data.europeana.eu/item/04802/243FA8618938F4117025F17A8B813C5F9AA4D619> <http://purl.org/dc/terms/subject> <http://www.wikidata.org/entity/Q12418> . # entitled "Mona Lisa" and created by Leonardo da Vinci. 01    <http://example.org/bob#me> <http://www.w3.org/1999/02/22-rdf-syntax-ns#type> <http://xmlns.com/foaf/0.1/Person> <http://example.org/bob> . 02    <http://example.org/bob#me> <http://xmlns.com/foaf/0.1/knows> <http://example.org/alice#me> <http://example.org/bob> . 03    <http://example.org/bob#me> <http://schema.org/birthDate> "1990-07-04"^^<http://www.w3.org/2001/XMLSchema#date> <http://example.org/bob> . 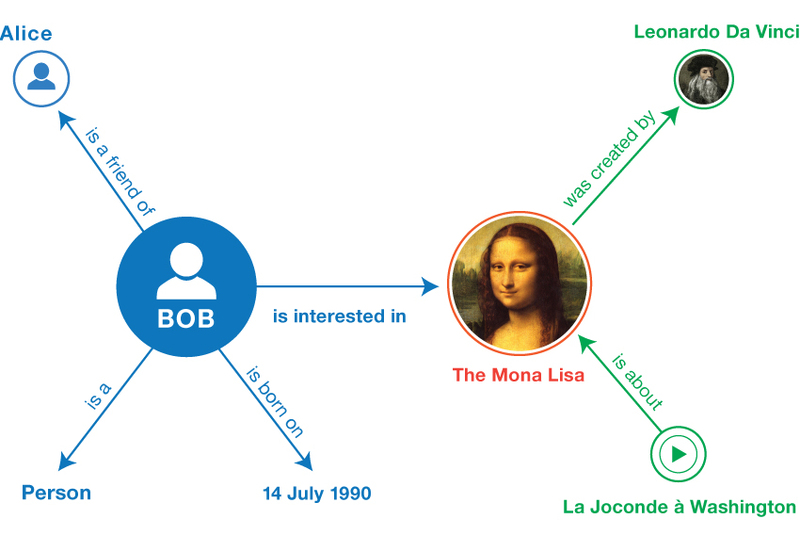 04    <http://example.org/bob#me> <http://xmlns.com/foaf/0.1/topic_interest> <http://www.wikidata.org/entity/Q12418> <http://example.org/bob> . 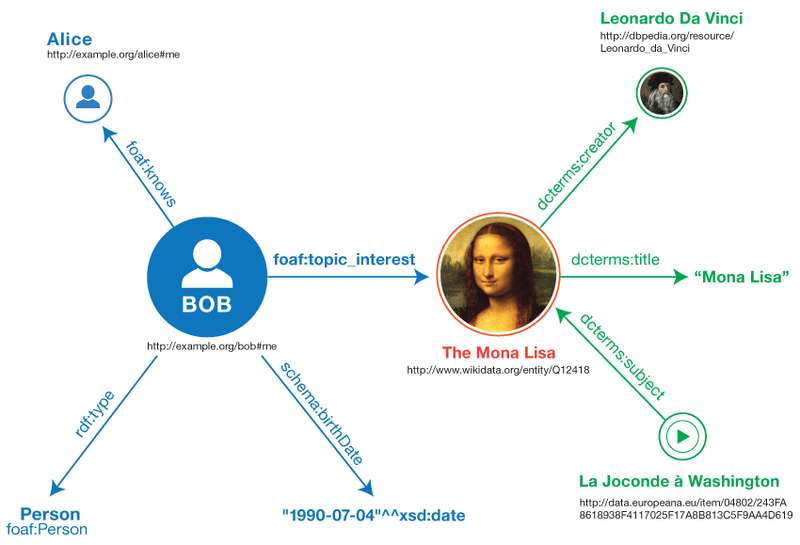 05    <http://www.wikidata.org/entity/Q12418> <http://purl.org/dc/terms/title> "Mona Lisa" <https://www.wikidata.org/wiki/Special:EntityData/Q12418> . 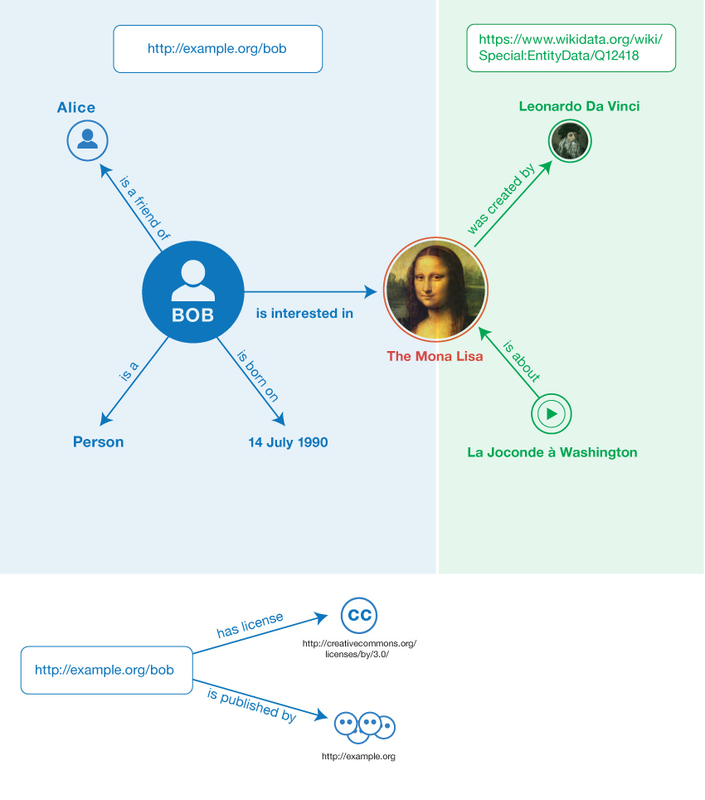 06    <http://www.wikidata.org/entity/Q12418> <http://purl.org/dc/terms/creator> <http://dbpedia.org/resource/Leonardo_da_Vinci> <https://www.wikidata.org/wiki/Special:EntityData/Q12418> . 07    <http://data.europeana.eu/item/04802/243FA8618938F4117025F17A8B813C5F9AA4D619> <http://purl.org/dc/terms/subject> <http://www.wikidata.org/entity/Q12418> <https://www.wikidata.org/wiki/Special:EntityData/Q12418> . 08    <http://example.org/bob> <http://purl.org/dc/terms/publisher> <http://example.org> . 09    <http://example.org/bob> <http://purl.org/dc/terms/rights> <http://creativecommons.org/licenses/by/3.0/> . 07        and was born on the <time property="schema:birthDate">1990-07-04</time>. 10        Bob is interested in <span property="foaf:topic_interest"
19        <a href="http://data.europeana.eu/item/04802/243FA8618938F4117025F17A8B813C5F9AA4D619">'La Joconde à Washington'</a>.